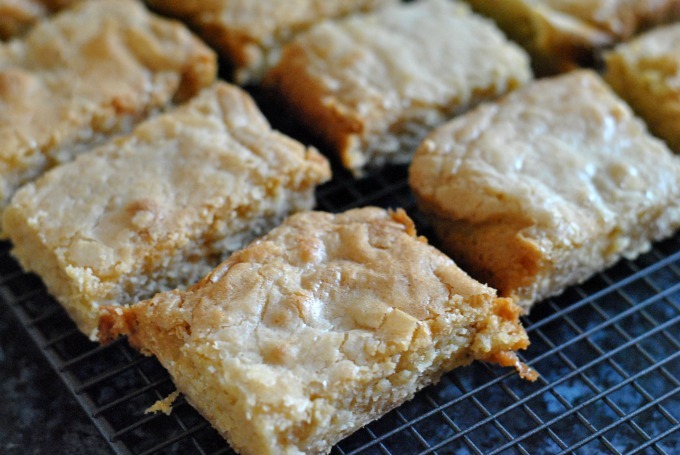 These blondies were the work of a flash of inspiration, a moment of pure recipe genius. Rhubarb is one of my favourite ingredients - prettily pink and perfectly tart - and it's just come back into season. The rhubarb available at this time of year is forced rhubarb, grown in the dark in sheds and picked by candlelight in a rather romantic setting that leads to tender, delicate fruit. Happily, much of this rhubarb is grown in the 'rhubarb triangle', right here on my very doorstep. This forced rhubarb is only available until March, when outdoor-grown rhubarb takes over, so I like to make the most of it whilst it's around. 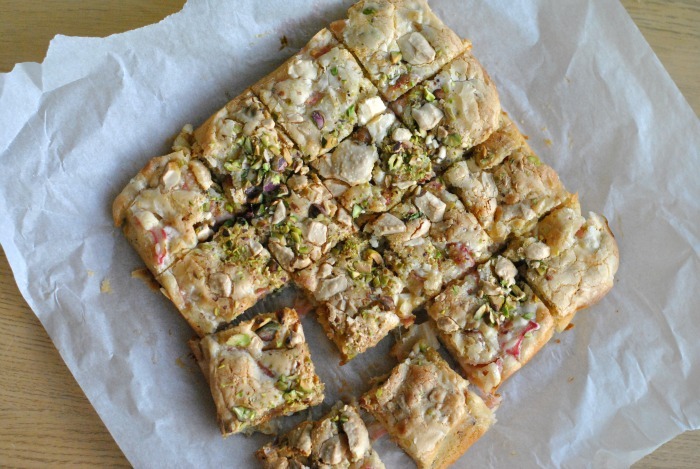 These blondies came to me whilst I was ruminating over the stalks that I'd just picked up at the greengrocer - the tart flavour of the rhubarb paired with the crunch (and wonderful green colour) of pistachios and the creamy white chocolate. For something dreamed up in my head and pulled together last minute, these blondies were a big success. I say as much, because at least two of my colleagues declared them to be the best thing I've ever baked. I'm not sure if they've cottoned on to the fact that the more praise I get, the more likely I am to spend my evenings whipping up sweet treats for them, but either way, it is the rhubarb that is the star of this show. Pre-heat the oven to 170C and line a square baking tin with baking paper. Place a bowl over a saucepan of simmering water and gently melt 150g of the white chocolate and the butter together. Remove from the heat and mix in the sugar. Beat in the eggs and vanilla extract - don't worry if the mixture looks like it is splitting at this stage. Sift in the flour and stir together until just combined. Throw in the rhubarb and most of the pistachios (save a handful to scatter on top) and fold into the batter. Pour the mixture into the prepared tin and smooth over with a knife. 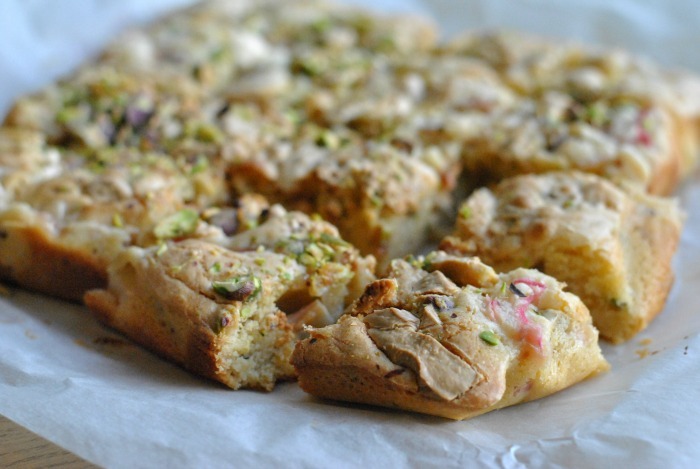 Scatter over the remaining chocolate and pistachios. 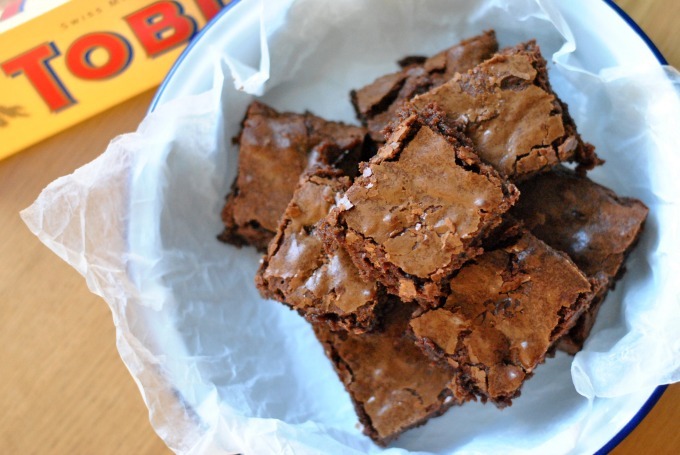 Bake for 35-40 minutes. The blondies should be firm and golden brown on top, but don't worry if a skewer doesn't come out completely clean. Leave to cool and cut into chunks to serve.